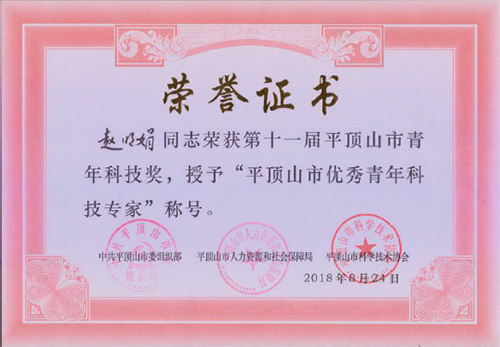 On 8 October, Yaomeng Power Company received a document from Pingdingshan applauding Zhao Mingjuan, an employee from the equipment maintenance department of the company. She won the 11th Young Technology Award of Pingdingshan and was named "Pingdingshan's Outstanding Young Scientist". The event is organised every two years. Such employee of the company has been granted the award twice. Zhao Mingjuan has served the company for 15 years. She possesses good professional skills, guiding her teammates to do their utmost in each and every task. She has published several high-quality papers on China's key journals, served as the editor for thermal inspection and maintenance regulations and procedure document, and acted as the host for some QC trainings. She won the first and second class prizes of Henan Outstanding Quality Management. As an employee responsible for power production technology, Zhao Mingjuan is always committed to improving the quality of equipment inspection and maintenance and enhancing the reliability of equipment. From formulating technological solutions to keeping track of the quality of inspection and maintenance and compiling equipment inspection and maintenance files, she is able to perform her duties faithfully, contributing to safe and stable operation of the company's machine units. Copyright © 2019 China Power International Development Limited. All Rights Reserved.